The MKII version of the PDO is available: Better CV handling, 16 HP, single PCB instead of stacked boards. An upgrade path is available for those with MKI versions, contact us for more information. 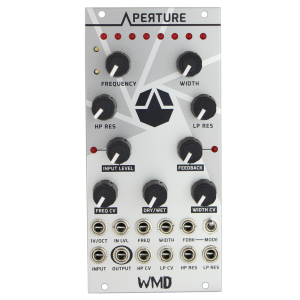 Introducing the WMD Phase Displacement Oscillator (PDO). This hybrid VCO has all the feel of an analog VCO but with the benefits of digital waveshaping. The PDO will easily find a home in your system! The PDO exists to utilize the phenomenon of Phase Modulation (PM). 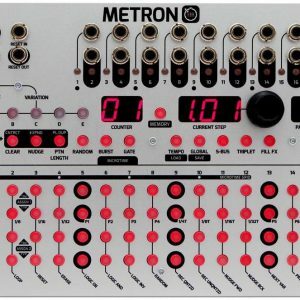 This allows for the relative phase difference of its outputs to be set or modulated, producing very interesting sounds. The result is similar to Frequency Modulation (FM) but affects the output to a greater degree without affecting the stability of the initial frequency. This is where the “displacement” comes in. When you use frequency stable phase displacement, you create phase distortion which sounds like wavefolding and is very useful for dynamic textures and powerful sounds. PM has the same benefits of quadrature filters/sine wave generators and greatly exceeds their capabilities at audio rate modulations. PM is highly useful for for creating metallic and bell tones and very controlled harmonic interactions. Because PM affects the relative phase and not the frequency of the waveform generated, the PDO can self modulate its PM inputs. This creates complex harmonic signals that seem to vary in frequency but are quite stable. Phase Modulation is also quite powerful when using the PDO as an LFO. 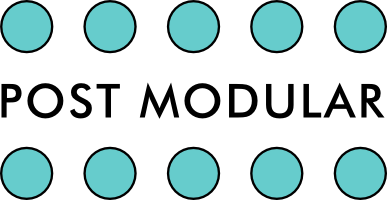 Adjusting the relative phase of each output allows for very precise modulation of other modules. Each output can have any of the available waveforms simultaneously. There is a myriad of modulation possible with the PDO! The Phase Displacement Oscillator’s analog VCO core should feel familiar and intuitive. 1V/Oct Input – Calibrated input for pitch control. The VCO will track at least 5 octaves using this input. Sync Input – Rising edge sawtooth reset/sync input. Does not affect slope of sawtooth. Use as LFO reset also. Coarse & Fine Knobs – Coarse knob adjusts the frequency of the VCO throughout its full range. Use the Fine knob to tune the oscillator within a 1/3 octave range. FM – Jack for Frequency Modulation. Type is selectable with switch between Exponential and Linear. Linear may be DC or AC coupled with a rear jumper. Phase Inputs (ΦCV) – The PDO has three phase inputs, one for each channel: 2, 3 and 4. These inputs can use any type of signal. Each phase input has an attenuator. Phase Offset (Φ) – These controls set the relative phase of each channel, from 0 degrees to + or – 360 degrees (total of 720 degrees). This control is added to the ΦCV input and acts as a bias level control when there is an input. Global Phase Input (ΦCV234) – This jack sends its signal to each phase input equally, allowing for a single signal to globally control the phase offset of each channel. 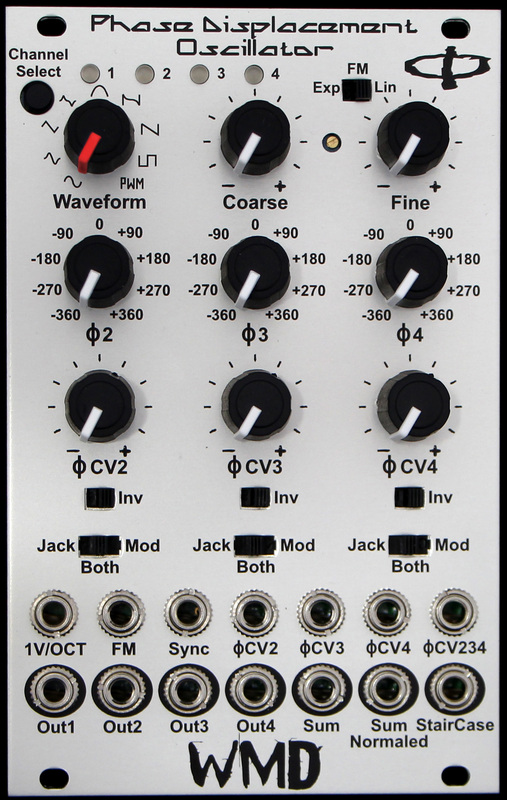 Jack / Both / Mod Switch – This switch controls routing of the CV signals for interfacing with the Triple Bipolar VCA. Jack allows the front panel jack and attenuator through. Mod allows just the input from the TBVCA through. Both sums both signals going into the phase modulation circuitry. 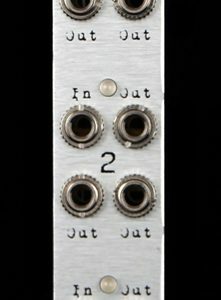 Inv Switch – This is the master invert switch for the sum of the Jack/Mod/Both and the Global phase input per channel. It will invert all signals. Out1 – Out4 – These are the outputs for each channel, the current level is displayed at the top of the module by a green LED. Sum Output – This output takes all four of the outputs and sums them together. Sum Normaled Output – This output takes each output (1-4) that do not have cables inserted and sums them together. Use this if you want to remove an output from the sum. Staircase Output (SC Out) – This output jack is the result of the relative phases of the three phase input channels compared to the analog sawtooth waveform. It forms a staircase type output (multiple square waves added together). There are two expansions for the PDO. 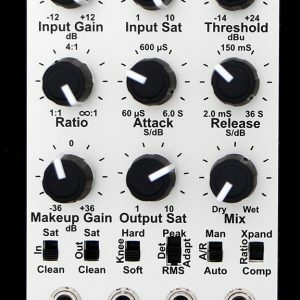 Quad Anti Aliasing Filter – This 4HP expansion module consists of four independent -24dB/octave Butterworth Low Pass Filters. They all share a common frequency input and bias knob. The QuadAAF independently filters each output from the PDO, providing an anti-aliased (smoother) output. There is also a sum output of all four filtered signals. See the Quad Anti Aliasing Filter here. Triple Bipolar VCA – This 8 HP expansion module contains three independent polarizing VCAs. This allows for Mod mode to be used which will produce stable wavefolding without patching. By applying envelopes and other signals, very dynamic patches can be produced. Check it out here.